These are wonderful, easy-to-grow hardy annuals - ‘stars’ of a Royal Horticultural Society trial, with an Award of Garden Merit (AGM). This Toadflax mix has a profusion of small snapdragon-like flowers from June to September in shades of white, lilac and pink. Plants grow to a height of 25-45cm and are great in cottage gardens, in containers, as bedding and cut flowers. 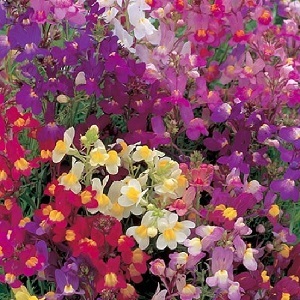 Toadflax grows best in sun to part shade and well-drained soil. Pack of approx 2,500 seeds. Sow directly into the ground in autumn or spring. Or sow in early spring indoors for planting out in late spring. Sowing instructions and a colour photo are printed on the packet.